The opportunity to lead by example by achieving a more sustainable way of life is more affordable and achievable than ever; solar thermal solutions provide this opportunity. A single unit is about 60 inches high and 61 inches wide; it weighs around 100lbs. The size of your home or business will change the number of units needed. We provide a standard 5 year warranty for all of our systems and an extended 10 year warranty is available. We suggest that the tubes themselves be wiped down with glass cleaner annually. The header manifold may need to be descaled every few years if you have overly hard water. How much energy does my family use to heat water? It is estimated that heating water for the average home accounts for about 20% of the overall energy use – and cost – in a single family home. How many units will we need? Generally a single unit is sufficient for a residential home with a family of four. 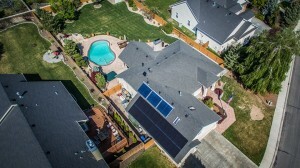 For clients wth larger families, additional heating needs, or for larger commercial installations please take advantage of our FREE no obligation solar site visits so we can provide you with a custom estimate specific to your solar needs.